. :: INTERNATIONAL DRESSAGE AND SHOW JUMPING FESTIVAL VERDEN AND WORLD BREEDING DRESSAGE CHAMPIONSHIPS FOR YOUNG HORSES ::. (Verden) She already captivated and enchanted as World Champion of five-year-old dressage horses last year, and she has lost nothing of her charm: Woodlander Farouche, the six-year-old chestnut mare by Fürst Heinrich – Dimaggio, who was honoured with scores between 8.9 and 9.8 in the qualification for the World Breeding Dressage Championships of Young Horses one year after her stunning success in Verden. 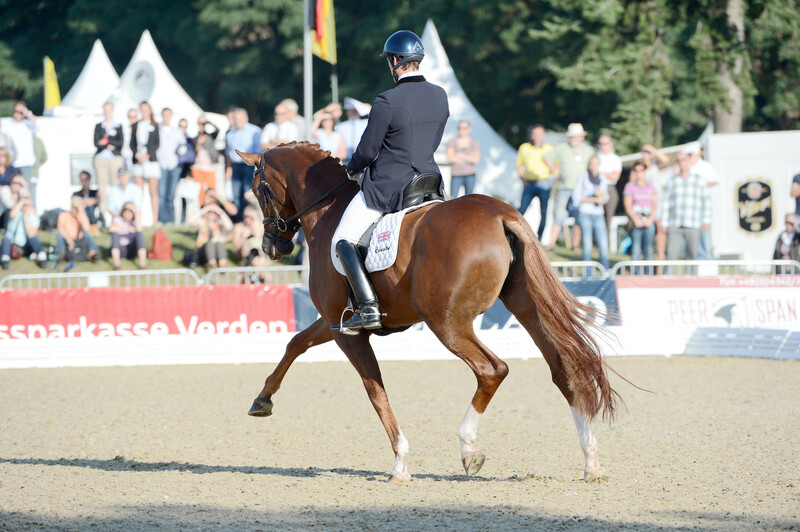 The Dutch stallion Borencio by Florencio I – Sinclair I finished second with a final score of 9.16. Emmelie Scholtens (Netherlands) who had already presented World Champions in Verden before, presented the stallion she also owns herself. The bay stallion got his best mark of 9.6 for his walk. The bay mare Novia by Stedinger – Alabaster, bred in Bavaria, took third place. She was presented by Victoria Michalke from Munich, scoring 9.3 for submissiveness, the best mark of the day in this category. Novia achieved a final score of 8.74. Fourth place went to a Westphalian and a KWPN-stallion: To the stallion Sunday NRW by Sandro Hit – Donnerhall who cannot deny his Oldenburg relatives and who was ridden by Anja Wilimzig (Milte-Sassenberg), and to Bordeaux, a Dutch-branded son by the Trakehnen stallion Gribaldi, presented by Eva Möller (Hagen a.T.W.). 34 horses from 13 different nations in total competed in the qualification for the WC-Final of six-year-old horses, and they attracted again crowds of spectators – Woodlander Farouche was certainly the number one attraction as the mare already shined at the World Championships in 2011. This press release is distributed on behalf of the Organizing Committee, Verden Turnier GmbH. For requests, please contact Comtainment GmbH, Martina Brueske, by cell phone ++49 (0) 177 – 7532625 or by email martina.brueske@comtainment.de.